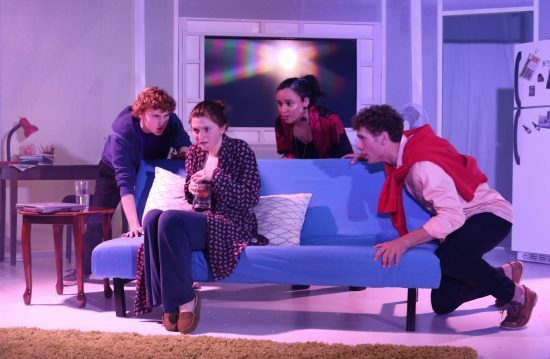 Dylan Kaufman, Madison Middleton, Isabella Benning, and Henry Wiebe in “Soon” at the Highwood Theatre. Photo by Angel Soriano. Nick Blaemire’s highly original 2015 musical “Soon” is currently in production at the Highwood Theatre — or, rather, in two separate productions. Highwood is itself highly original, in that it is both a professional theatre and a teaching company for young performers, and director Cate Caplin has set two quartets of actors to work on Blaemire’s show, one made up of adult performers, and one consisting of high school seniors. …“Soon” offers a chance to see four rising talents in a clever show by another theatrical voice on the rise. “Soon” centers around Charlie, an aspiring baker who lives in Greenwich Village and who has lately let her despair at the state of the world push her into agoraphobia. As the play begins, she is staring at CNN as Wolf Blitzer announces that catastrophic climate change will doom the planet much sooner than even the most pessimistic scientists had thought — roughly one year hence. There is more to Charlie’s story than it seems at first, and “Soon”’s major twist is a genuine surprise. While the actors handle the shifting emotional complexity well, Blaemire’s music and lyrics are stronger than his book, and a few scenes get overwrought and bogged down. “Soon” is primarily a tight and smart show, but Blaemire could perhaps use a collaborator for future efforts. Highwood’s technical crew is made up of students ranging from fifth grade to high school, and they have done an admirably professional job in the company’s small black box. Charlie’s apartment has basic white walls, and that lack of color and the scant furnishings let the lighting by Jonah Witte and Eliana Beals-Simon change the color of the scene to reflect the protagonist’s changing emotional state. One downside of the Highwood space is that it is not acoustically blessed, so the actors sometimes must fight the instruments to be heard clearly. All four manage to do this effectively, though occasionally at the cost of nuance. Even so, “Soon” offers a chance to see four rising talents in a clever show by another theatrical voice on the rise. The adult cast consists of Julia Capizzi (Charlie), Karen Harris (Adrienne), Andrew Overton (Steven), and Daniel Westbrook (Jonah). Running Time: One hour and 30 minutes with no intermission. “Soon” runs through April 29, 2018, at the Highwood Theatre, 914 Silver Spring Avenue, Silver Spring. Click here for tickets.